With its release last October, Felt’s new trail bike came a bit late to the party–after tradeshow season and while the testing phase of our annual buyer's guide, The Bible of Bike Tests, was already underway. But we wasted little time ordering a Decree after returning home this past fall. With its clean lines, uncluttered 140-millimeter rear-suspension design and intriguing geometry numbers, it had serious potential. The first thing I noticed about the Decree was its incredible lateral stiffness, thanks to the massive tubes and large bottom-bracket and headtube junctions on its full-carbon chassis. Looking down on it while riding, the wide-and-flat toptube resembles the deck of an aircraft carrier, giving the rider a palpable feeling of confidence. This feeling is echoed on the trail, with the Decree's excellent tracking and steering response. I like the aesthetic form of the frame as well, with one clean line arching its way from the toptube, through the seatstay, to the rear axle. This, in addition to the placement and clocking of the rocker link, ties the front and rear ends together nicely. Other Felts we've tested have looked like the front and rear triangles were designed separately, so aesthetically, the Decree is a huge step forward. Adding to the cleanliness of the Decree's form is the suspension design, dubbed 'Felt Active Stay Technology,' or F.A.S.T. 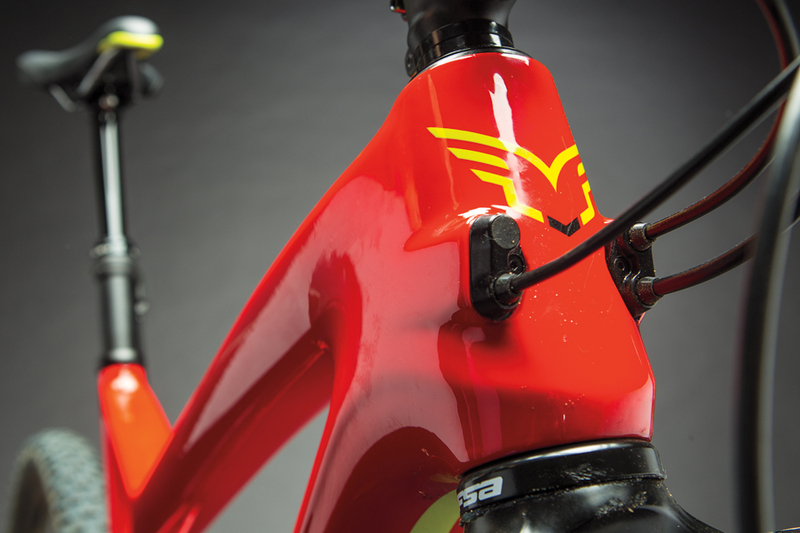 The modified single-pivot system relies on flexing carbon seatstays instead of a pivot. Beyond looking nice and eliminating a pivot, the stays act as a leaf spring. The rear end is molded in such a way that the stays push on the shock slightly at the top of the travel, helping to initiate movement. Then, at proper sag, the spring force is neutral, and finally, toward the end of the bike's travel, the leaf-spring stays help resist harsh bottoming. F.A.S.T. was originally designed for XC race bikes, so there's no surprise that the Decree climbs like a champ, even when the shock is open. Locking it out is unnecessary on everything except pavement. Between the efficiency of the rear end and the reasonable 66.5-degree head angle (with the 150-mil-travel RockShox Pike), the Decree scoots up climbs without the front wheel wandering. 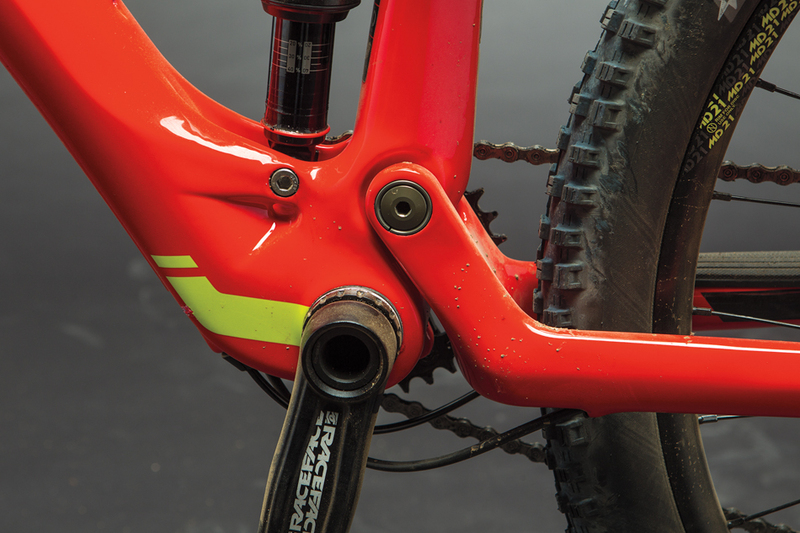 It may seem like the flexing stays would prevent the suspension from moving freely, but cycling the rear end through its travel with the shock disconnected is nearly as smooth as doing so on bikes with a pivot back there. But the small amount of spring in the stays does seem responsible for providing a welcome amount of pop to the suspension feel. The pivots that the Decree does have use large axles and clean hardware, including a locking collet axle on the main pivot, preventing it from coming loose. The Decree handles g-outs and large impacts with dignity, and I never felt a sharp bottom-out on successive square-edge hits. Though small-bump sensitivity doesn't quite achieve Holy Grail status, the suspension didn't show any outright flaws or sketchy behavior when ridden hard. With its 16.9-inch chainstays, 24.6-inch (size large) toptube, 46-inch wheelbase and poppy suspension, the Decree felt balanced and snappy. The 27.5-inch wheels allow the bike to be tossed around with ease. It's a fun, lively trail bike capable of handling most terrain, and it constantly motivated me to pedal harder and find more trail features on which to play. There are a few other things worth mentioning about the Decree's carbon frame, starting with the internal cable routing. 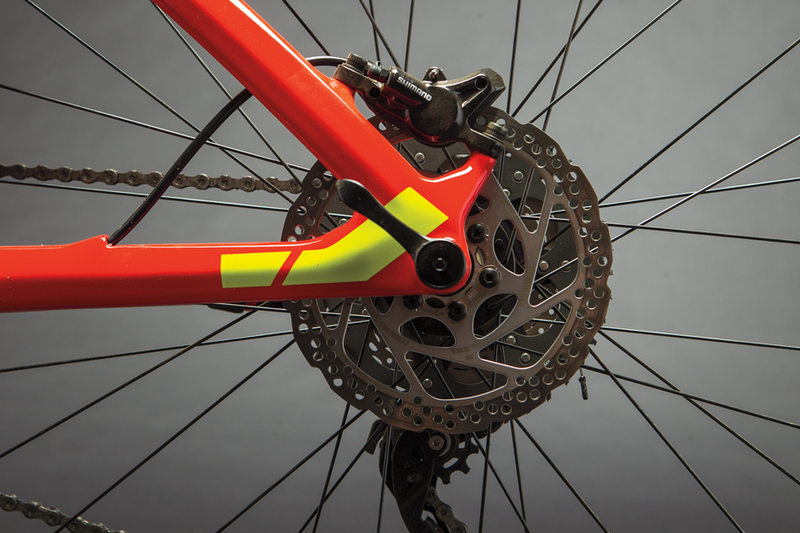 Every cable, including the rear brake, is run internally and there are multiple exit ports to accommodate a standard or side-swing front derailleur as well as droppers with internal or external routing. Rubber grommets at all entry (and some exit) ports grip the housing tightly, but once inside the frame, there's nothing preventing the housing from rattling in the large, echoey tubes. Good shops have tricks to silence loud internally routed cables, but it'd be nice if this was taken care of by the factory. No matter how you feel about the cable routing, there's no arguing against Felt's choice of a threaded bottom-bracket shell and ISCG tabs. And the frame uses a standard 200 x 57-millimeter shock. We chose the $4500 Decree 3 because it seemed to have the highest bang-for-the-buck factor of the lineup. At the heart of the build, you'll find a Shimano XT 11-speed shifter, derailleur and cassette, RockShox Pike RC fork and Monarch Debonair shock. Race Face Ride cranks, Alex Rims, Shimano Deore brakes and a KS Lev DX dropper round out the no-nonsense build. I would love to see Shimano SLX brakes, and the Schwalbe Nobby Nic tires didn't provide adequate grip on the loose terrain in Southern California, but otherwise I'm happy with the components. Also, the Decree 3 comes in at 27.5 pounds without pedals, which is impressively light for a bike with mid-level parts and a frame this laterally stiff. The Decree is a welcome addition to Felt's trail lineup, representing a solid improvement in both performance and aesthetic to the company's full-suspension offering.